Magic Carpet lift on bunny hill is totally free to all novices who want to practice. Customer service details like Kleenex dispernsers can be felt a long way s awaya. 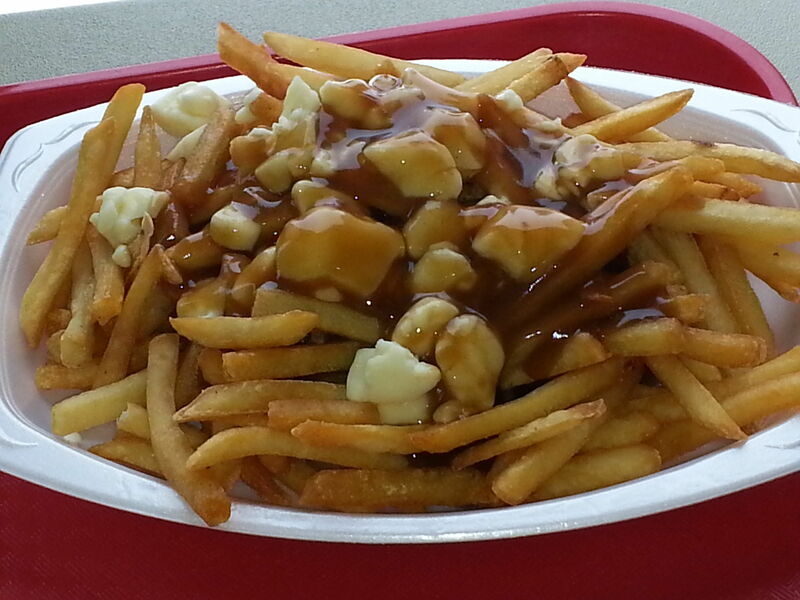 Homemade poutine is one of the mountain's best sellers. 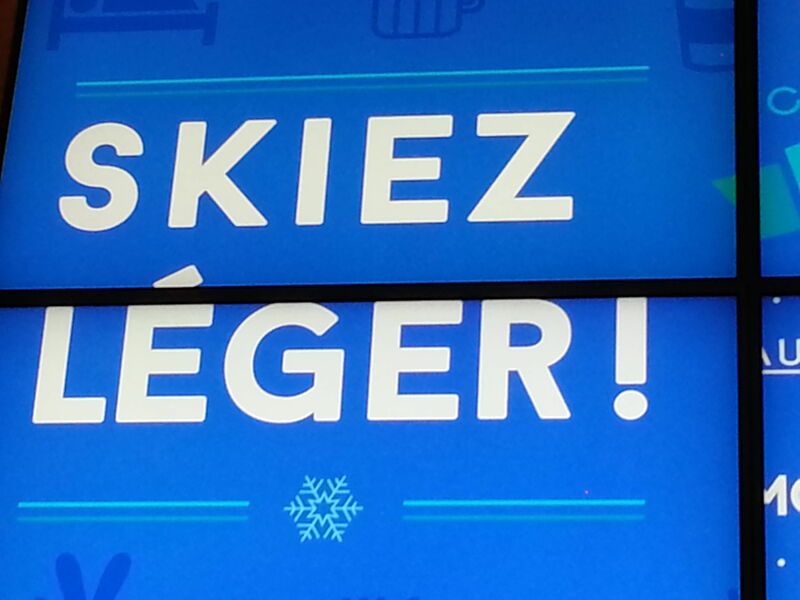 Video snowsports safety messages play throughout the lodges. 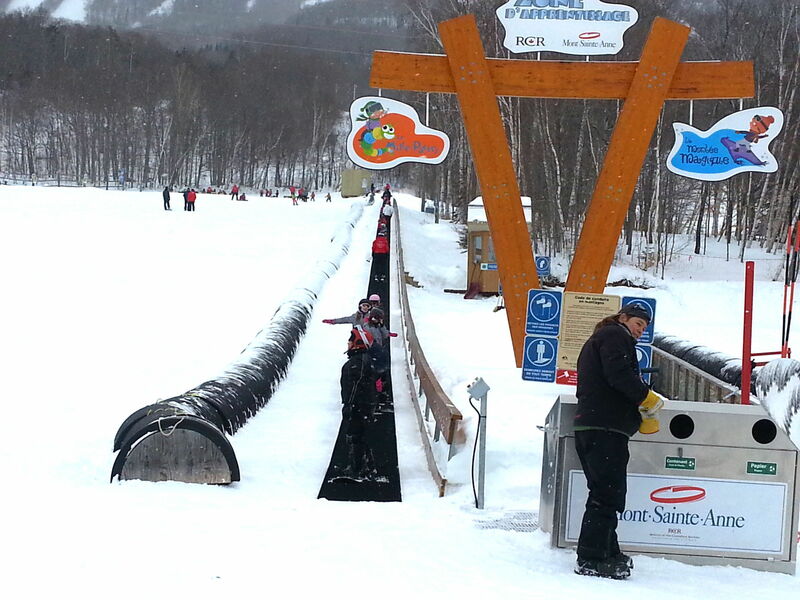 Hit the slopes at Mont-Sainte-Anne, a child-friendly Canadian mountain resort where cheap lift tickets and lessons mean learning the sport is affordable and fun. It’s French-ish, it’s snowy and it’s very welcoming, with children of all ages giggling on the beaten snow paths around the base village. It’s Mont-Sainte-Anne Resort, Quebec, one of Canada’s top ski resorts, and one of the best kept family vacation secrets in the Northeast. At our recent visit over Presidents Day week, we met other Americans who had discovered that there were no ‘holiday rates’ in effect here. Our very large, balconied room with kitchenette was priced as a winter special with an exchange rate that made it 20% cheaper than it seemed. Throughout the mid-November to early May season, families will find similar unexpected opportunities for very good skiing and boarding at great rates. Best of all was our view from the balcony over the slopes each evening, as Mont-Sainte-Anne lit up to accommodate hardy night skiers and boarders. More developed with family amenities than at our first visit a decade ago, Mont-Sainte-Anne has a convenient base village so you can park, ski, stay and relax. The well organized Sports Alpins shop rents excellent quality equipment fitted by a helpful staff. Their boutique sells stylish winter wear, as well as the hand and boot warmers you’ll probably need. This is Canada, and you’ll find niceties like Kleenex at the gondola, and a very accommodating lift staff of locals. On mountain, there’s a charming log cabin Sugar Shack for maple treats, and the runs are well groomed — manmade powder over an ice base that wore well. With its main (warmer) south face overlooking the glittery, ice-crusted St. Lawrence, and smaller north and west sides facing the forest, Mont-Sainte-Anne is large enough to provide a weekend of varied expert and intermediate runs and small enough to be manageable for young skiers out on their own. Best yet, the beginner slope and long magic carpet are open free of charge every day for novices to practice. So, once the kids have had a lesson, you can come here as a family and help each other carve those turns. 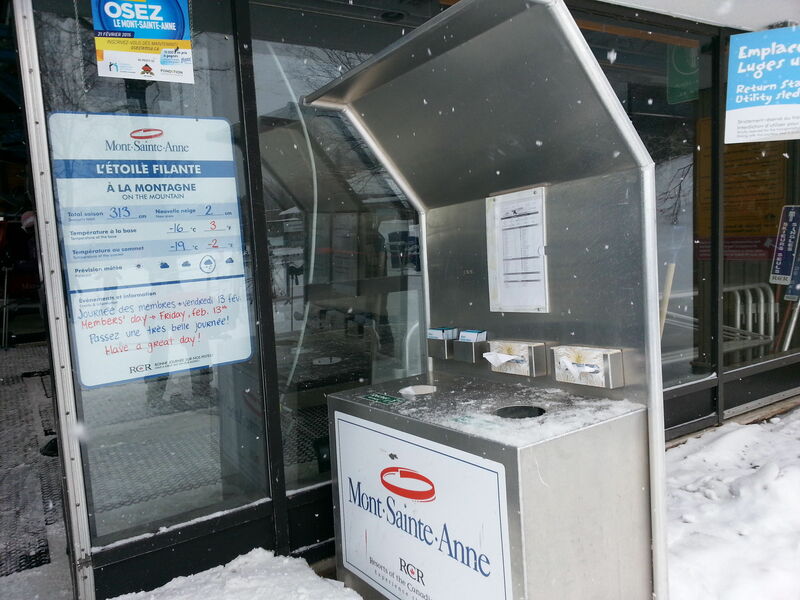 Mont Sainte-Anne has a modern garderie in its Centre des Enfants, where infants 6-months to 2-years are tended by women trained in 1st Aid and annual early childhood education courses. It’s a quiet and bright area, with cribs, play mats and feeding stands. Reserve early, as many babies return on ‘season tickets’ bought by local parents. Another larger room filled with crafts and art areas, building blocks and toys, and a TV lounge caters to those over age 3 who need watching but aren’t skiers. At the heart of the Childrens Center are the bright green vests and helmets seen on dozens of children; Star Camp is for ages 3-6, from 9am to 4pm daily with one hour lessons. The 6-14 years Kids’ Clinic group of snow lovers can ski or ride the mountain, with bargain group lessons, on day-long programs held during school holiday weeks. Never-evers can join the Telus Learn to Ski and Snowboard Program for ages 7+ which offer a 1.5 hour lesson with gear and lift ticket in 1, 2, or 3-day packages: the 3-day Initiation Package is a great learn-a-snowsports deal at just CAD$199 for everything. When we got back upstairs after a day of skiing, thousands of flakes twinkling on the illuminated slopes beckoned us back outside. Still sore, we suited up and strolled out to the boot lockers. Avoiding the small crowd at the gondola, we timidly took the quad up and began a wondrous run, all alone down the Chemin du Roi, carving through fresh snow surrounded by thick evergreen stands. This delicious taste of night skiing, new to all of us, was just enough to make our legs wobble and our bellies growl. Although the ski resort’s base cafeteria was bustling with Saturday-Nighters, we chose a contemporary, country-French bistro in the village. It’s one of many local restaurants found at the base and nearby in Sainte-Anne-de-Beaupre. This bistro was one of the few French touches we found. Although the casual, fast-food style and functional decor recall local American slopes more than chic Chamonix, there are touches like the hearty poutine, a potato dish slathered in gravy and locally produced cheese curds, that defy classification. However, the kids can practice their French and everyone you need speaks good English. Perhaps most important, it remains a total bargain for the elevation (800m/2625 ft), size of terrain (222 hectares/547 acres), vertical drop (625m/2050 ft), number of runs (71) served by 1 gondola and 6 lifts, two terrain parks with their own lifts, and daycare and ski school facilities. And the attitude? Priceless, as you can see in this video by Ron Bozman. Contact Mont-Sainte-Anne Resort (418/827-4561 or 888/827-4579), located at 2000, boulevard Beau Pre, Beaupre (Quebec) G0A 1E0 Canada for reservations, information and daycare bookings. Their list of screened babysitters is available to hotel guests as well. At the base, Chateau Mont Sainte-Anne has grown to include convention space as well as a variety of condos, studio apartments and hotel rooms. Part of the complex, Espace Nordik has duplex one- and two-bedroom units. There are a few hundred casual, country style rooms and suites with fireplaces in the main lodge, and many vacation condos for sale in adjoining buildings. It’s pet-friendly and has many family amenities such as an indoor pool and hot tub, an outdoor pool open summers, a sauna and free WiFi. For après ski, families will appreciate the toddler playroom, Teen Lounge, an arcade with shuffleboard, ping pong and inexpensive video games, organized family activities like marshmallow roasts and hot chocolate breaks, nightly family movie screenings, and even an EV charging station for your Tesla. And as you approach the resort from the West, you can’t help but notice the enormous Basilica of Sainte-Anne-de-Beaupre, a shrine dating to the mid-1600s honoring Sainte-Anne, who is known for her many healing miracles. More than 500,000 pilgrims visit Quebec’s patron saint each year; her name day is celebrated July 26th. Be sure to stop in and admire the lavish interior of this famous church. Lastly, remember that this resort is very good value compared to ski in/ski out accommodations at many US resorts, and the current exchange rate makes the dollar stronger. We suggest you package your gear with a lift ticket and group lessons for the best values. Terrific four- and five-day ski or surf (French for snowboarding) packages occur throughout the season, sometimes during US holidays that are not celebrated in Canada.